Endometriosis Update: What am I doing? “What am I doing?” A question I usually ask myself in a moment of crushing self-realisation after drinking a not insignificant amount of a famous brand of bourbon and embarrassing myself in front of my peers on a night out. But in this instance, the question ‘what am I doing?’ refers to the subject matter of my research. I’ve been doing my PhD for just over a year now and have only recently found my stride with it. Scientific research can be a perplexing venture; I’ve changed focus more times than I care to count. Of course a big part of that is my own tendency to pursue new avenues of interest like a dog being thrown a bucket of tennis balls. My main interest has and always will be endometriosis and working at this university has given me lots of opportunities (too many opportunities actually, not that that’s a bad thing) to investigate endo in different ways. Every new idea I have, there are the facilities here to investigate it, like being a kid in a candy store, but instead of candy store it’s a vast scientific research institute. But anyway, enough of that rambling, I was talking about being focussed. My research is examining the role that fatty acids play in regulating inflammation in endometriosis. ‘Fatty acids’ is a bit of a vague term so I’ll clarify that first. You’ve probably heard of Omega-6 and Omega-3 polyunsaturated fatty acids; different foodstuffs like to advertise that they are ‘rich in Omega-3s’ or something along those lines. These include essential fatty acids such as eicosapentaenoic acid (EPA) and docosahexaenoic acid (DHA), which fall under the Omega-3 category. Then there is arachidonic acid and linoleic acid which fall under the Omega-6 category. We get a lot of these fatty acids from our food, but it’s what our body does with them that’s important. When our body takes in these fatty acids, they are incorporated into the outer layer of our cells (the cell membrane) which acts as a storage space for them. The stored fatty acids can then be release from the membrane and converted into a whole plethora of different products by different enzymes, which can serve a whole manner of different functions (below is a diagram that summarises the process). In one sense this is why maintaining a healthy diet is important, it means you get the right balance of these fatty acids. From the other perspective, it may not matter how good your diet is, because your body (or certain parts of it) may not process the fatty acids correctly due to the presence/absence of certain enzymes or receptors for these fatty acids. One function regulated by the products of omega-6 and omega-3 fatty acids is inflammation, which is very important when talking about endometriosis. Your body treats endometriosis very much like a wound, but a wound it can’t heal, so it releases a number of chemicals which ramp up the inflammatory response near the disease. Some of the products of fatty acid metabolism are key players in regulating this inflammatory response. In addition, this rogue inflammation is thought to contribute to the severe pain symptoms with which so many women with endo suffer. 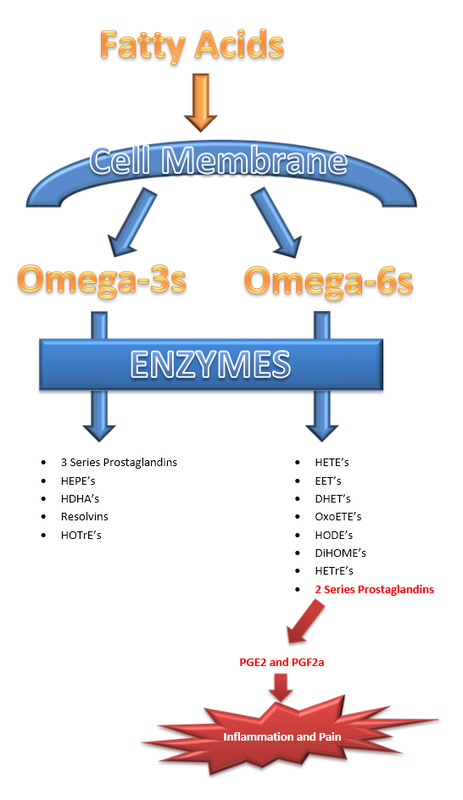 You’ll notice that one of the products of Omega-6 fatty acids, the 2 series prostaglandins, are highlighted in red. This is because they are the only group of fatty acid products that we know the function of in the reproductive system in any great detail. There are numerous members of the series 2 prostaglandin family, but I’ve selected prostaglandin E2 (PGE2) and F2 alpha (PGF2a) as they are known to produce a strong inflammatory response. All of the others (don’t worry what the acronyms stand for, we’ll be drowning in syllables if I put the full names in) we don’t have any idea what roles they play, if any, in the normal function of the female reproductive system and what the consequences would be if they went awry. So the first part of my research is to investigate which of these fatty acid products are present in the endometrium. This is actually pretty exciting because it means making genuine discoveries. As I mentioned above we don’t know which of these fatty acid products are present in the endometrium, so discovering that will be something no-one has ever done before, exactly the type of thing us science geeks get excited about. The second part will be to find out what differences there are, if any, in the fatty acid products from the endometrium of women with and women without endometriosis. Hopefully, finding fatty acids that are either much higher or much lower amounts in endometriosis patients will give some indication as to which of them are important. Because we don’t really know what these fatty acid products do in the uterus there’s no telling how important they may be; they might control inflammation, they might be important for hormone regulation, they may even be involved in fertility, or they may just be inconsequential. No matter what the outcome that is pretty much what I’m doing and hopefully it will lead to discoveries that will help us better understand (and better treat) the symptoms of endometriosis.